The 6 year old World Championship Final also did not disappoint in terms of food for thought as a breeder. These are some of the rides that caught my eye. British bred talent was very much to the fore at the 2018 Hartpury Festival of Dressage. The highlight of the young horse classes on Saturday was the £1000 to the winner, Elite Stallions sponsored, Young Horse PSG. Every year we focus on the British bred contenders lining up for the Mitsubishi Motors Badminton Horse Trials – one of the pinnacle events of modern eventing. Any serious eventing breeder dreams of seeing a homebred horse gallop past Badminton House on cross country day, and for the lucky few listed below, that dream will come true this weekend. The highlight of the whole week from a breeding point of view has to be crowning of Hayley Watson-Greaves as the new Lemieux National Champion on her British Hanoverian WG Rubins Nite. 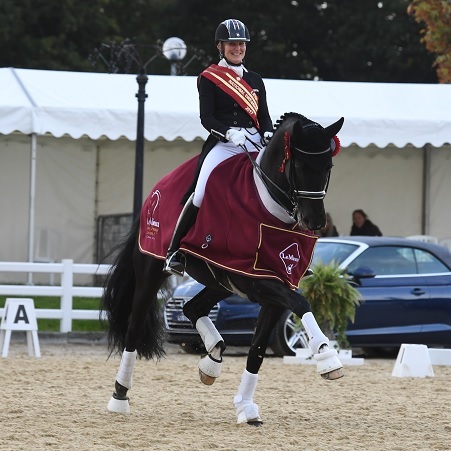 Although just pipped to the post in the freestyle by Carl Hester and Alcazar and by Lara Butler and Rubin Al Asad in the Grand Prix, Hayley’s consistency over the two days, was well rewarded. Day two stated as day one had ended, with a British bred victory.